There is another GPS event occurring this weekend . Paging operations are expected to continue without interruption. However, this one is a bit different as it will also underline a date limitation in the older Trimble GPS heads and cause a reporting discrepancy moving forward. The date issue is similar to the year 2000 concerns. Specifically after Saturday night 5-22-16 8 pm EDT, the C2000 equipment will display and report information with an older time reference. Equipment connected to the older receivers will report alarms as if it were 6-9-1996. Sunday will be 6-10-1996. 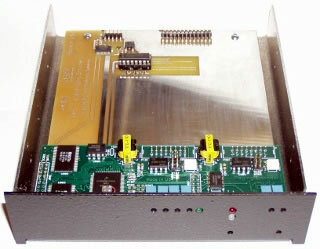 Vaughan has been very busy helping clients resolve issues with their GPS synchronization this week. P.S. 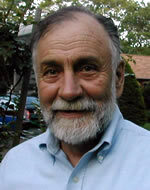 Vaughan Bowden, a good friend and a loyal supporter of this newsletter, was formerly vice president of engineering at PageNet—the world's largest paging system at that time. And those are only the public deals. “There are others that aren’t public,” he said. Currently, two-thirds of all traffic on undersea Atlantic cables is from private networks and not telecommunications companies, up from 20% in 2010, according to TeleGeography data. In the past five years, demand for bandwidth has shifted from traditional telecom companies to large content providers. Their need for bandwidth is growing so rapidly that it makes economic sense for them to invest in their own infrastructure, said Gartner analyst David Smith. “Rather than pay a telco, they’re going to build their own,” he said. The Microsoft/Facebook cable will be called "Marea," which means "tide" in Spanish. The companies are collaborating in order to accelerate the development of the next-generation of Internet infrastructure and support the explosion of data consumption and rapid growth of each company’s respective cloud and online services, Microsoft said in a statement to USA TODAY. While the cable's actual width is about the size of an ordinary garden hose, its capacity is "massive," able to transmit 160 terabytes per second, said Mauldin. Currently there are about 337 terabytes of potential capacity across the Atlantic. When the Marea cable comes online in 2017 with 140 terabytes per second of capacity, “this one cable will be able to do almost half of what all the cables do,” he said. Marea will be operated and managed by Telxius, a telecommunications infrastructure company owned by Telefónica, a large, Spanish telecommunications company with a significant presence in Europe and Latin America. The cable will also provide redundancy for companies increasingly dependent on information being instantly transmittable worldwide. Marea will be the first southern European cable route. No one wants to have their capacity dependent on just one cable, "because if it breaks, you’re in trouble,” said Mauldin. Being physically separate from these other cables helps ensure more resilient and reliable connections for both companies' customers in the United States, Europe, and beyond, Microsoft said in a statement. While many still imagine that traffic between the continents runs via satellites, they’re neither fast nor good enough. “There a huge delay with satellites,” said Smith. Cables are almost instantaneous, more robust and cheaper. As tech companies increasingly become international, "the cloud is under the ocean," he said. The cable will help the companies meet growing customer demand for high speed, reliable connections for cloud and online services, Microsoft said in a post on its website. Microsoft said it needed the increased bandwidth to it could provide high speed, reliable connections for customers using Microsoft cloud services, which include its search engine Bing, Office 365, Skype, Xbox Live, and Microsoft’s cloud computing platform Azure. 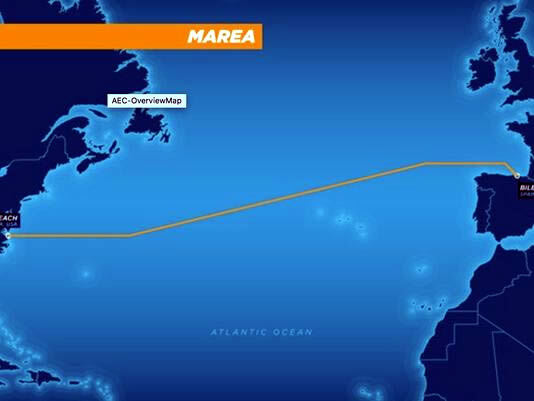 MAREA will be the highest-capacity subsea cable yet laid across the Atlantic, It will feature eight fiber pairs and have an initial estimated capacity of 160 Tbps. It’s now possible for your computer to be updated to Windows 10 without your explicit content. Microsoft’s putting away the carrots and breaking out the sticks in its quest to migrate 1 billion users to Windows 10 over the next couple of years. After pushing out the free upgrade as a Recommended update to Windows 7 and 8 users earlier this year—which means that you downloaded the initial installation bits if you use the default Windows Update, like most people should—Microsoft changed its nagging pop-up prompt in an insidious way over the past week. For the past six months, the “Get Windows 10” pop-up asked permission to start an update, but lacked a “No thanks” option, so the only way to avoid it was to close the window by pressing the X in the upper-right hand corner. Now, the pop-up says “We will upgrade you at this time,” and pressing the X counts as consent. You need to click a small, easily missed link in the pop-up to cancel the upgrade, instead. It’s a nasty bait-and-switch after months of using an incessant pop-up—which can’t be disabled without the help of registry hacks and other advanced tricks—that wore down users, encouraging them to simply X out of the irritant when it appeared each and every time they opened their computer. Worse, it’s now possible for your computer to be updated to Windows 10 without your explicit content. Judging by the hundreds of comments on Reddit , Twitter , PCWorld , my inbox, and other places across the web in response to the situation, a lot of people are finding themselves upgrading unintentionally. And, well, a lot of them are pissed. 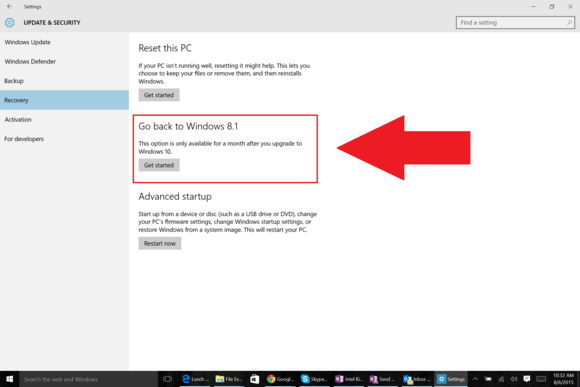 Fortunately, it’s easy to roll your PC back to Windows 7 or 8 after installing Windows 10. The easiest time to say “No” is during the initial setup process. If you decline Windows 10’s end user license agreement, it’ll bring you back to your older operating system. But what if it’s too late for that? You’re allowed to roll back to your previous Windows version for 30 days after upgrading to Windows 10. Simply open the Start menu and head to Settings > Update & Security > Recovery. If you’re eligible to downgrade, you’ll see an option that says “Go back to Windows 7” or “Go back to Windows 8.1,” depending on which operating system you upgraded from. Simply click the Get started button and go along for the ride. Once you’ve returned to your previous version of Windows, you need to tinker with it to perfect your setup once again. In particular, you may need to reinstall some programs, and don’t forget to use your Windows 7 password rather than your Windows 10 password if you created a Microsoft Account for the new operating system during the set-up process. Once you’ve upgraded a PC to Windows 10, you’ll always be able to do so again in the future. But if you aren’t enticed by Windows 10’s best features and more subtle awesome tweaks —a feeling I completely understand after a non-consensual upgrade—you can turn to a pair of helpful tools to disable the Windows 10 upgrade prompts from returning. GWX Control Panel was the first anti-Windows 10 pop-up tool on the block, and it works marvelously, though its complicated user interface is full of granular options and may turn off some people. Never10 by noted security researcher Steve Gibson performs the same basic task in a much simpler way. Either program does the trick. GWX Control Panel and Never10 will also prevent your computer from being upgraded to Windows 10 if it hasn’t yet. Installing one of those is a much better option than disabling Windows Updates completely to avoid Microsoft’s pestering, as disabling patches can leave you vulnerable to new security flaws. Now for the good news: Microsoft says it plans to phase out the GWX pop-up once it starts charging for the Windows 10 upgrade in July. Fingers crossed. This story, "How to go back to Windows 7 or 8 after an unwanted Windows 10 upgrade" was originally published by PCWorld . The U.S. public-safety market is in the midst of changing from analog to digital communications technology. In many cases, the driver for this shift has been the switch from analog two-way voice communications to digital Project 25 (P25) infrastructure. The alerting infrastructure for paging in most cases has been running on the analog network in parallel. For successful migration planning, the future of the alerting infrastructure needs to be taken into account to avoid loss of performance, high costs and frustration of personnel. Traditionally, analog networks carried both two-way voice communications and the paging systems to alert volunteer and full-time responders. For several reasons, this infrastructure has come to the end of its lifecycle. This is because of technological advances and, in many cases, lack of investment in new infrastructure. The recent switch to narrowband technology has also led to a loss of paging coverage. Not receiving an alert is a nightmare for every committed firefighter who is on standby to help fight fires and save lives. The transition to digital voice communications systems brings great advantages for voice communications, but the paging side is often left with the old analog networks. Along with the lack of coverage, analog paging has additional disadvantages. Pager users are not able to listen to the new P25 ground channel and the operation and maintenance of the old analog networks are too costly when used for paging alone. Many agencies choose one of two solutions to resolve this dilemma, neither of which is compliant with the National Fire Protection Agency (NFPA) 1221 standards or cost effective. Use P25 pagers on the same network. To migrate analog pagers, some agencies consider using P25 pagers. However, their use comes with four major disadvantages. 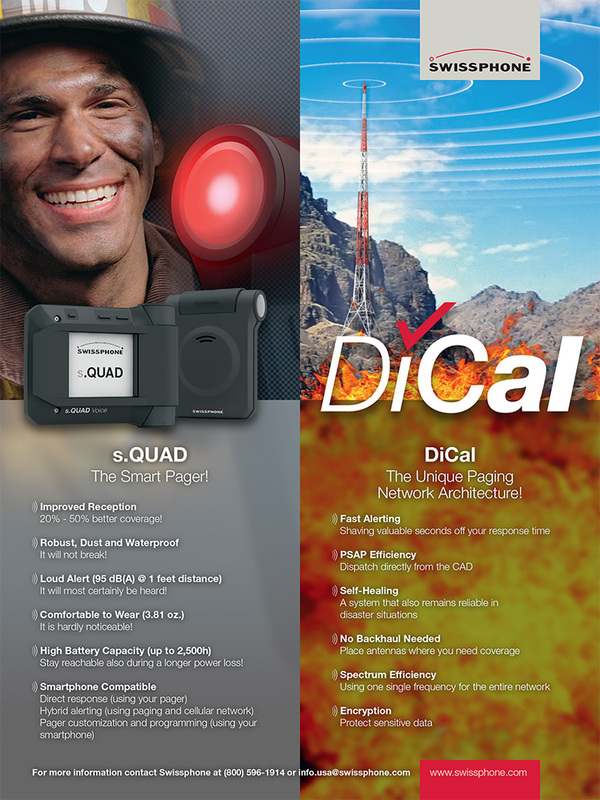 P25 pagers are costly, priced at nearly $1,000 vs. a high-quality digital fire pager running on the predominant global standard for digital paging, POCSAG protocol, which costs around $200. 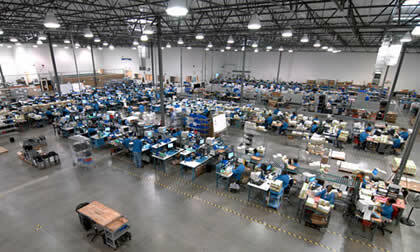 For a fleet of 300 pagers, this results in a difference of $240,000. If you consider a fleet replacement every five years, this cost difference increases to $720,000 during a 15-year period. Pagers based on technology designed for two-way radio devices are quite big and bulky and need to be recharged every one to two days. In comparison, high-quality digital pagers are slim and can run up to three months on one battery, making them convenient for volunteer firefighters who carry their pagers every day. Additionally, digital pagers can be operated for months on a single AA battery, an ideal solution in the case of a power outage or as a permanent solution for agencies that want to avoid the cost of battery chargers altogether. P25 networks are often designed and built for outdoor coverage. Alerting networks built specifically for volunteer firemen typically have higher requirements, both in regard to coverage in remote and rural areas and in terms of in-building coverage. Consequently, even with modern P25 pagers, firefighters may not receive an alert. Given the cost of P25 base stations, it would be costly to densify the P25 network to make it comply with the requirements of an alerting infrastructure for firefighters. A combined communications and alerting infrastructure is not redundant because it operates as a single network without a secondary or backup network, making it vulnerable during times it is needed the most. That is why the NFPA 1221 standard asks for separate communications and alerting networks. Use cellular-based services to alert first responders. Smartphone apps have seen large growth during the past few years thanks to the marketing efforts of the startup companies behind these services. But they come with several drawbacks for public safety. App-based messaging services run on commercial cellular networks. These public networks may work fine in normal situations. However, during a crisis such as a tornado, large fire or earthquake, this communications channel can be overloaded within a few minutes and eventually go out of service. When firefighters are needed the most, they cannot be alerted and therefore cannot respond to action. The NFPA 1221 standard explicitly exempts alerting solutions based on commercial telephone infrastructure (9.1.1.3.3, 9.1.1.4 (5)). Settling for app-based alerting services while at the same time investing heavily in a state-of-the-art P25 system for voice is not a wise place to cut costs when you’re trying to improve overall public-safety services. For these reasons, switching analog paging to P25-based alerting or cellular-based messaging solutions is not viable when planning to go digital with mission-critical communications systems. 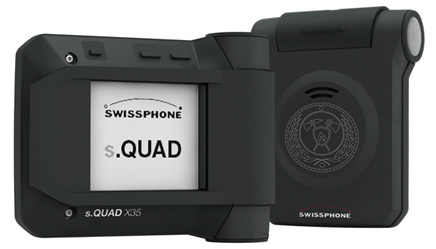 Swissphone offers a third solution including turnkey digital alerting infrastructure that improves coverage and reliability beyond traditional analog tone and voice paging systems. The system is the next level of “simulcast paging.” The system is fully redundant to a P25 system and thus in full compliance with the NFPA 1221 standards. The devices are easy to carry and run up to three months on one battery. The network architecture enhances coverage beyond that of a P25 network, making it adaptable for firefighting agencies. The cost is about 5 percent of the cost of an entire P25 project, and it includes a network controller, base stations, pagers and dispatch platform. The digital paging solution is based on the POCSAG protocol, which meets all relevant NFPA 1221 requirements for alerting. 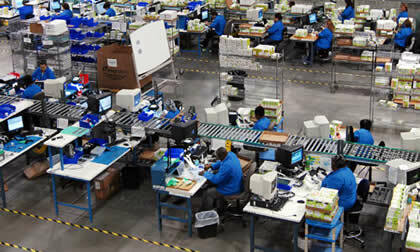 The interface to the CAD system shortens the time for dispatch and improves response time. Unlike analog voice paging, the dispatcher does not need to prepare or wait and speak the message to be transmitted. The dispatcher can send predefined alphanumeric messages immediately. Also, having a redundant digital paging network alongside the P25 network reduces possible radio transmission and channel conflicts, reducing dispatch time even further. Patented DiCal technology allows base stations to communicate over a backhaul network, but also over the air, using a single frequency/channel for alerting, monitoring and configuration. The base stations are energy efficient and can be powered by solar panels and batteries if needed. 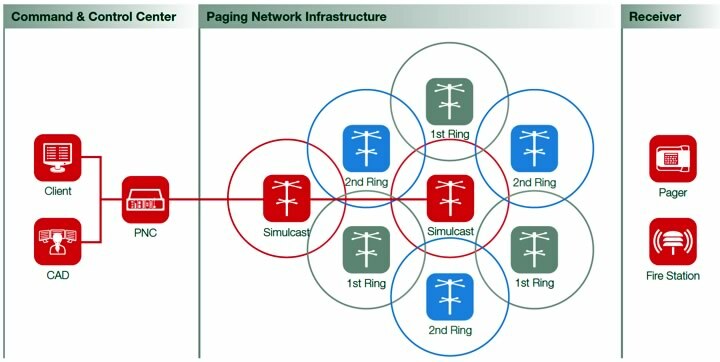 Additional transmitter sites don’t rely on an IP or microwave connection for backhaul. The base stations can therefore be placed at any location at little cost, allowing optimal rural and indoor coverage. The network architecture is fully redundant, allowing continued operations if any of its components are out of service. Also, it consists of several fallback layers to the point of alerting the entire network from any base station if other systems are broken. The QUAD pagers are durable as demonstrated by a 6.5-foot drop test onto concrete. They are also waterproof with an IP-67 rating. The units remain operational up to three months without battery recharging. If needed, they also run with one standard AA battery. 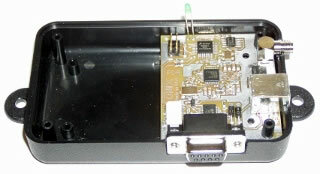 The pager comes with a standard Bluetooth low energy (BLE) connection, allowing it to connect to smartphones. This functionality enables the pager to respond to an alert or change a responder’s availability status, displayed and managed in the dispatch platform. 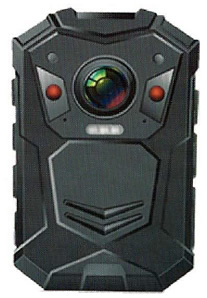 The unit is also capable of being both an analog voice pager and a digital alphanumeric pager. A simple firmware update allows users to turn the analog device into a digital one. As a third component, the system comes with various alerting clients as well as a software platform, enabling monitoring of resources. Operations directors can view the availability of relief forces or the effective strength of teams and groups on a display screen and then alert as necessary. Also, they will know which firemen are responding to an incident. Thanks to the BLE interface of the pager, the same platform allows for hybrid alerting and messaging, with the pager receiving the alerts via two networks — the paging and cellular networks. Should reception on one network be inadequate, the alerts are received via the other network. The pager’s alert suppression feature ensures that the pager doesn’t go off twice for the same alert. Black Hawk County, Iowa, is a leader in public-safety communications technology with a history of early adoption of 800 MHz trunking and pioneering text to 9-1-1. Its territory covers 573 square miles, which was previously covered by a single analog base station, along with two store/forward repeaters for two-tone paging. When county officials started planning for a switch to P25, they wanted to improve and modernize their paging system rather than simply replacing it with the same technology they’d had for the past 20 years. They leveraged the five planned P25 tower sites for enhanced simulcast coverage with paging base stations and have the flexibility to further extend coverage as the county grows. The resulting NFPA compliance of the combined solution was one of the reasons why the entire project received funding by elected county officials and was purchased from RACOM, Swissphone’s distribution partner and local project integrator for Black Hawk County. The implementation and rollout of such a system takes only a couple of weeks. The base stations can be placed where they are needed: rack mounted on existing tower sites or wall mounted on every other location. It is worthwhile to consider both voice communications with radios and alerting with paging when switching to P25. A planned migration of P25 is the best moment to plan a paging upgrade to increase coverage where you need it, shorten the alerting time, reduce operational costs, improve user acceptance and compliance, and be fully in line with NFPA 1221 standards. 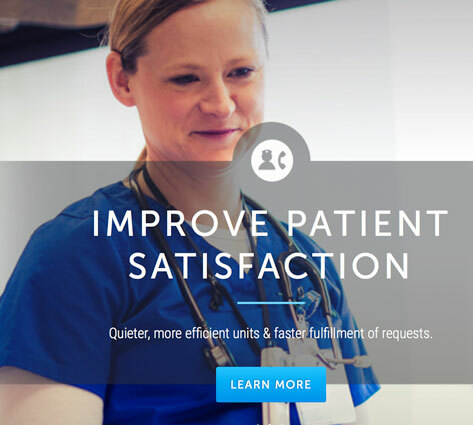 As in the case of Blackhawk County, a combination of a digital migration to both P25 and digital paging at the same time can significantly increase the chance of funding for the entire project. This opportunity makes it worthwhile to specify the future paging solution when applying for P25 project grants. 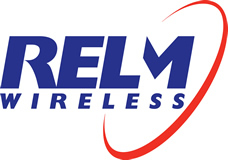 On May 18, the FCC’s Wireline Competition Bureau issued a Public Notice seeking affirmation from any carrier with a currently pending Lifeline compliance plan request or petition for designation as a Lifeline-only eligible telecommunications carrier (ETC), containing an affirmative written statement that the carrier remains interested in having the Bureau review its application. This statement must be filed with the Bureau no later than June 7, 2016. According to the Public Notice, the affirmations are being sought in light of the fact that several orders amending the Lifeline rules and requirements, some of which have changed significantly, were adopted during the pendency of these proceedings. We recently sent reminders to our law firm’s Lower 700 MHz Band A- and B-Block licensee clients of a 35% geographic buildout and service obligation that must be completed by December 13, 2016. Our memo also reported that how other clients had encountered technical difficulties when filing required shapefile maps due to discrepancies with FCC datasets. Accordingly, we recommended early submission of these required notifications, if at all possible, to allow time to discover and correct any data issues. Removing the “LAT_DD” and “LON_DD” fields from only the Signal Coverage Attributes table. Two changes to the “Standards” section. Updating the URL for accessing template and market-based boundary files, which can be found at https://www.fcc.gov/general/700-mhz-construction-notification-requirements . Updating the resolution requirement for coverage boundaries specified in Standard #5 from 10 meters to 100 meters. These changes are incorporated into a NEW summary of Shapefile Contents and Submission Process (effective May 19, 2016) in Attachment A of the Public Notice. Those clients with 700 MHz geographic buildout requirements coming due in December should forward the revised standards to their staff and/or RF engineering consultants who are assisting with preparation of the engineering statement and electronic maps in support of their 700 MHz interim construction benchmark showing. We expect that use of the revised template and market-based boundary files will reduce the likelihood of errors that some clients have reported when submitting electronic map files to the FCC. Nonetheless, we continue recommend early submission of 700 MHz construction notifications, if at all possible, to avoid technical problems that might lead to a late filing (and possible regulatory consequences). On May 23, the FCC’s Consumer and Governmental Affairs Bureau issued a Public Notice that seeks comment on the industry’s level of compliance with congressional mandates of the Twenty-First Century Communications and Video Accessibility Act of 2010 (CVAA). Comments are due June 13. The CVAA requires telecommunications carriers, interconnected voice over Internet protocol (VoIP) service providers, advanced communications service (ACS) providers, and equipment manufacturers (collectively known as “covered entities”) to make their services and equipment accessible to and usable by individuals with disabilities, if readily achievable (defined as “easily accomplishable and able to be carried out without much difficulty or expense”). It also requires the FCC’s biennial report to contain the following: An assessment of the level of compliance with the CVAA; an evaluation of the extent to which any accessibility barriers still exist with respect to new communications technologies; and an assessment of the effect of the CVAA requirements on the development and deployment of new communications technologies. the state of accessibility of services and equipment used with the following: (1) “non-mobile” services, including, but not limited to analog and digital telephone handsets and cordless phones used with landline and ACS; and (2) “mobile” or wireless services, including basic phones and smart phones. 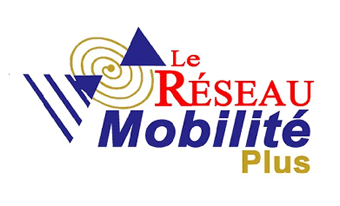 Whether manufacturers and service providers are including people with disabilities in their market research, product design, testing, pilot demonstrations, and product trials. To what extent covered entities are working cooperatively with disability-related organizations in their efforts to incorporate accessibility, usability, and compatibility of equipment and services throughout their processes for product design, development, and fabrication. Whether covered entities are making reasonable efforts to validate unproven access solutions through testing with people with disabilities or with organizations that have expertise with people with disabilities. The report is to be submitted to Congress by October 8, 2016. The FCC will seek public comment on its tentative findings on these matters before submitting the biennial report to Congress. a Report & Order and Further Notice of Proposed Rulemaking regarding a competitive bidding process for high-cost universal service support from Phase II of the Connect America Fund. The Open Meeting is scheduled to begin at 10:30 a.m., and will be broadcast live at that time at www.fcc.gov/live . The FCC has issued its annual Notice of Proposed Rulemaking and Order in connection with the collection of annual regulatory fees for Fiscal Year 2015. Comments on the FCC’s proposals will be due June 20, 2016 and Reply Comments will be due July 5, 2016 . This year, the FCC has proposed to collect $384,012,497 in regulatory fees. Of this amount, the FCC will collect $81.9 million or 21.3 percent from Wireless Telecommunications Bureau regulatees, $146.8 million or 38.19 percent from Wireline Competition Bureau regulatees, $21.4 million or 5.56 percent from International Bureau regulatees, and $133.97 million or 34.95 percent from Media Bureau regulatees. Last year, the FCC increased the threshold for the de minimis from $10.00 for all fees owed by a regulate to $500.00. Because this exemption can be changed from time-to-time, it is important that regulates review their regulatory fee obligation annually in order to determine if the fee due for that year will exceed the threshold. We also recommend that those clients claiming an exemption under the de minimis rule affirmatively file a letter with the Commission in order to avoid being red-lighted for non-payment of the regulatory fee. Last year, the FCC adopted its proposal to establish a regulatory fee for Direct Broadcast Satellite (DBS) as a subcategory in the CATV and IPTV categories. Based upon the FCC’s experience it has proposed a fee increase for this subcategory from $.12 to $.27 per subscriber per year. This proposed fee includes a base amount of $.24 and a proportional adjustment of $.03 per subscriber. In using this fee structure, the FCC has previously noted that it is important to note that DBS service providers wear two hats — multichannel video programming distributors (MVPDs) as regulated by the Media Bureau and users of geostationary space stations that are used to provide one-way subscription video service to consumers — which is regulated by the International Bureau. In order to properly allocate costs, the FCC subjects DBS providers to two regulatory fees in order to recover the relevant costs associated with each operating bureau. On May 24, the House Appropriations Committee released the fiscal year 2017 “Financial Services and General Government Appropriations” bill, which will be considered in subcommittee tomorrow. The bill provides annual funding for multiple U.S. agencies, including the FCC. Among other things, the bill contains $315 million for the FCC — a cut of $69 million below the fiscal year 2016 enacted level and $43 million below the request. It also prohibits the FCC from implementing the net neutrality order until certain court cases are resolved, requires newly proposed regulations to be made publicly available for 21 days before the Commission votes on them, prohibits the FCC from regulating broadband rates, and requires the FCC to refrain from further activity of the recently proposed set-top box rule until a study is completed. A full copy of the draft can be found here . On May 23, news sources are reporting that the U.S. House of Representatives voted down the Kelsey Smith Act, primarily due to Democratic opposition. The vote was 229 in favor and 158 against the bill, with Democrats comprising 108 of the opposing votes. In voting down the legislation, concerns over privacy protections were cited. Unsuccessful amendments had been proposed to address the issue, such as a process to evaluate location information requests after the fact. "Democrats strong support the intention behind this bill, but we cannot support it as currently drafted," Rep. John Sarbanes reportedly said in a floor speech. On May 24, the FCC published its Lifeline Modernization Third Report and Order in the Federal Register, establishing an effective date for those rules not requiring approval by the Office of Management and Budget of June 23. Originally released on April 27, the Order allows for Lifeline support for standalone fixed and mobile broadband services, as well as establishes minimum service standards for broadband and mobile voice services offered through the program. The changes will occur over a five and one-half year transition, during which the FCC will gradually increase mobile voice and data requirements and gradually decrease voice support levels. The Order also establishes the National Verifier, which is intended to transfer the responsibility of eligibility determination away from Lifeline providers, thereby lowering costs of conducting verification and reducing the risks of facing a verification-related enforcement action. The Order also creates a streamlined federal Lifeline Broadband Provider designation process as an alternative to the traditional ETC designation process, establishes an annual budget of $2.25 billion, and adopts other reforms to the recertification process. Carriers with questions about the Order should contact the firm for more information. On May 19, the FCC’s Chief Technologist, Office of General Counsel, and Enforcement Bureau issued a Public Notice offer guidance regarding acceptable ways to disclose network performance so as to satisfy the enhanced transparency requirements in the 2015 Open Internet Order, including what point-of-sale disclosures will meet the rule’s requirements. Small providers (100,000 or fewer broadband connections) are exempt from the enhanced transparency requirements (but not the original transparency requirements, which include the point-of-sale requirement) until December 2016. Service Tiers. For fixed BIAS providers, the obligation in the Transparency Rule to disclose performance characteristics for “each broadband service” requires separate disclosures for each technology ( e.g., digital subscriber line (DSL), cable, fiber, or satellite) and service tier ( e.g., 50 Mbps download / 10 Mbps upload) of a given service, as it is the combination of technology and service tier that BIAS providers use to market the service. Disclosure of Actual Network Performance Metrics. Providers may comply with the requirement to disclose actual speeds—both download and upload—by disclosing either the median speed or a range of actual speeds that includes the median speed ( e.g., 25 th to 75 th percentile). Similarly, latency may be disclosed using either the median latency or a range of actual latencies that includes the median latency (e.g., 25 th to 75 th percentile). Packet loss may be disclosed as the average packet loss. Geographic Granularity for Actual Network Performance Metrics. Fixed BIAS providers may meet this requirement by disclosing actual performance metrics for “each broadband service” in each geographic area in which the service has a distinctive set of network performance metrics (operational area). Mobile BIAS with access to reliable actual data on network performance may meet this requirement by disclosing actual performance metrics for each Cellular Market Area (CMA) in which the service is offered. Disclosure of Expected Network Performance Metrics. There is no corresponding requirement to disclose different expected network performance metrics in different geographic areas. However, expected network performance disclosed for a geographic area should not exceed actual network performance in that geographic area. Peak Usage Periods. Peak usage periods may be based solely on the local time zone, and BIAS providers retain flexibility to determine the appropriate peak usage periods for their network performance metrics but must disclose the peak usage periods chosen for such disclosures. The Bureaus also noted that participation in the Measuring Broadband America (MBA) program remains a safe harbor for BIAS providers in meeting the requirement to disclose actual network performance. As a result, fixed BIAS providers may disclose their results from the MBA program, for each service for which the program provides network performance metrics, as a sufficient representation of actual download and upload speeds, actual latency, and actual packet loss of those services. Mobile BIAS providers may disclose their results from the mobile MBA program as a sufficient disclosure of actual download and upload speeds, actual latency, and actual packet loss of a service if the results satisfy the appropriate sample size criteria. Fixed BIAS providers not using the MBA safe harbor may disclose actual network performance metrics based on the MBA methodology for “internal testing; consumer speed test data; or other data regarding network performance, including reliable, relevant data from third-party sources.” Mobile BIAS providers that, instead of taking advantage of the MBA safe harbor, measure network performance by their own or third-party testing may disclose performance metrics for each CMA in which the service is offered, except that actual network performance may be aggregated among CMAs with a population density below 250 people per square mile. Finally, the Bureaus noted that disclosures required under the Transparency Rule be prominently displayed “on a publicly available website” and made at the point of sale, and may be made by directing consumers to a website link. However, while disclosures may be made via a link to a website, for those disclosures to be meaningful, BIAS providers must ensure that consumers actually receive any Open Internet-related information that is relevant to their purchasing decision at all potential points of sale, including in a store, over the phone, and online. On May 18, the FCC issued a press release announcing the launch of its new online Consumer Complaint Data Center. Informal complaints submitted to the FCC are added to the database, which is updated on a daily basis. The database includes the service the consumer is complaining about (phone, TV, Internet, radio, emergency, or accessibility), the method by which the consumer receives the service (such as wireless vs. VoIP phone), the issue the consumer is complaining about and the consumer’s general location information. According to the press release, the Consumer Complaint Data Center allows users to “easily track, search, sort and download information … [and] build their own visualizations, charts and graphs.” The data is also available via API, which allows developers to build applications, conduct analyses and perform research, or embed it on other websites. In comments (attached below) filed on May 26, the ARRL said it “strongly supports” a petition to the FCC seeking to eliminate an Amateur Service rule, spelled out in §97.317(a)(2), that amateur amplifiers not be able to boost the RF input signal by more than 15 dB. The Petition for Rule Making (RM-11767), was submitted in April on behalf of an amateur amplifier distributor, Expert Linears America LLC of Magnolia, Texas. The ARRL noted that while the FCC eliminated some of the unnecessary regulations in 2004, others remain, including the 15 dB gain restriction. The rules adopted in 1978 also called for type acceptance (certification) of manufactured RF power amplifiers operating below 144 MHz, including a 50 W minimum drive power requirement and a ban on amplifiers capable of operation between 24 and 35 MHz. The League agreed with the petitioner that a current generation of low-power Amateur Radio transceivers, including software-defined designs, cannot drive an amplifier to full legal power given the 15 dB limitation. “It should not be necessary to configure an Amateur Radio station to include an additional amplifier stage in order to make use of current SDR technology in the Amateur Service,” the ARRL said. I enjoyed your newsletter commentary. It brought back so many memories, so many in fact that I had to send you a note. I remember when we thought that 2way paging would be the wave of the future, and it is, first Blackberry then texting. I always thought it would keep going. I too got out of paging because the declines were fast and sharp. I really enjoyed paging from a technical standpoint. I worked for Metrocall then for TSR Wireless, where I was the VP of engineering for years until the new leadership took over. Then I saw the decline of the company as well as the industry, all at the same time. I was lucky because I was able to keep going. I realize now that I should have gotten into cellular earlier. Big mistake on my part, but I can't believe how it took over the world. All the same, your message about how "wrong" we were hit me like a rock. I remember sitting with Motorola and one guy there told me that paging would go away and be replaced by cellular. I got so mad! I complained to our salesman, but I think that Motorola saw it before we did. They knew that paging was declining. In fact, they shut down their Ft Worth facility pretty soon after that. I could not believe it! It really threw me for a loop. Paging soon died a painful death. At least the business did. People don't realize that the engineers and technicians, at lease the good ones, worked on so many technologies. Think about it. We did the terminals, T1, line interfaces, networking, even back when it was token ring, RF, installations, site design, computer room design, and so much more. It was so exciting and fun. Now it's all gone, pretty much. I do miss it. Just thought I would share my feelings of loss along with you. 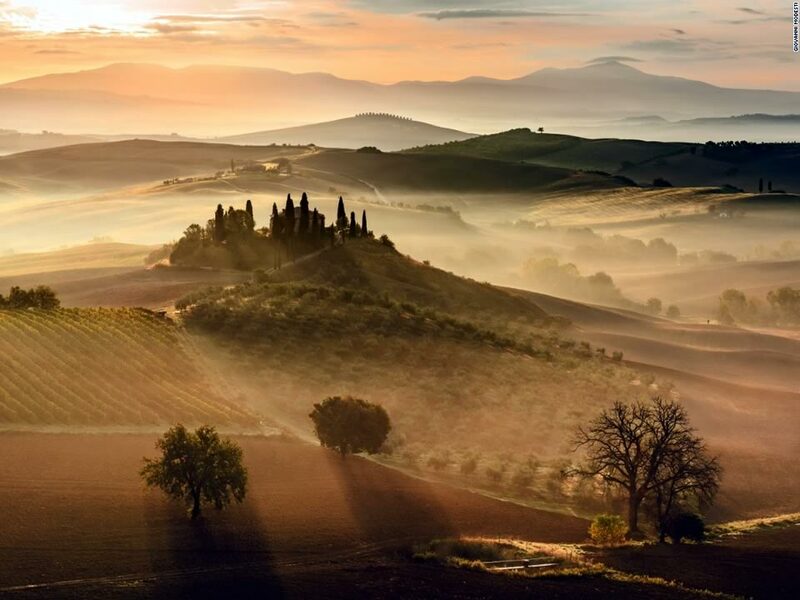 Beautiful at any time of day, the Italian region of Tuscany looks even more wonderful in this sunrise image taken by Giovanni Modesti.